I found a more sophisticated experiment on how long gum lasts at http://www.che.utexas.edu/cache/newsletters/fall2003_active.pdf. C. Meal  Before vs After. The author, Gerardine G. Botte (currently at Ohio University http://webche.ent.ohiou.edu/faculty/botte.html), suggested students at the University of Minnesota Duluth chew on this as homework for their Design of Engineering Experiments class. Many other fun ideas for DOE exercises are provided by Professor Botte. I wish I had her as a statistics teacher! PS. Breaking news: Chewing gum makes you smarter and good-looking! Wrigley gum researchers hope to prove this by investing in unbiased (?) experimentation on these possible benefits to masticating their product. See http://tinyurl.com/papg8 for their publicity on this research initiative. 1. FAQ: Why is there no intercept in models for mixture designs? 6. Workshop Alert: "Crash Course on DOE for Sales & Marketing"
PS. Quote for the month: How to get the Net Generation engaged in statistics classes. 1. FAQ: Why is there no intercept in models from mixture designs? "Why do I not have the intercept as in a regular factorial model in my analysis of a mixture experiment set up on Design-Expert® software?" We make use of a mixture model developed by Scheffe, which is characterized by not having an intercept or squared terms for the quadratic form. For the mathematical details, see these lecture notes by Professor Steve Buyske (link provided with his express permission) from the Statistics Department of Rutgers University: http://www.stat.rutgers.edu/~buyske/591/lect09.pdf. As he states "...Design-Expert will analyze mixture designs with aplomb..."
"I saw your DOE FAQ Alert electronic newsletter on the internet and I was wondering if I could ask you a question about an issue I am having with setting up a DOE design. I am trying to set up a four-factor, three-level design. Since it is three-level, (I know that the response is nonlinear), I wanted to use a central composite design (CCD), but one of my factors, "types of acids", is qualitative. I have three different types of acids that I want to try. The other three factors are quantitative. I realize that the CCD design is only for quantitative factors, but since I have three different acids types can I still use the CCD design?" Yes, but it must be a three-factor CCD replicated on each of the three acids, or, more efficiently, a D optimal fraction aimed at fitting the four-factor quadratic model  the backbone of response surface methods (RSM). Our software Design-Expert Version 7 provides the necessary tools (free trial available at http://www.statease.com/soft_ftp.html). The objective is to increase speed and maximize distance. By running a half-factorial DOE you can get two transfer functions for speed and distance which yields an optimum or close to optimum answer. Then one can perform validation runs for the remaining eight runs in addition to creating a full-factorial design. — If you ask the student to find the best speed and distance without teaching DOE, the chances are they will reach the optimum in 15 trials but they will continue trying further experiments without realizing they have reached the optimum design. — The two transfer functions contradict each other and now the solution becomes a question about optimization: What will you compromise  speed or distance? — No interactions are significant, hence using one factor at a time or sticking with the winner approach works in this case, but if there were interactions the student needs to understand DOE. — For the factor valve diameter the response is not linear, hence if you selected two extreme settings, the chances are you will not get optimum transfer function, but if you selected the 2nd and 4th levels it will be better, yet not the best. This should take you into a discussion on selection of regions such that the assumption of linearity is valid, or consideration for a central composited design (CCD) for generating a non-linear response surface. Caution  since the simulation is very simple so is the learning. It is good simulation for those who are doing DOE for the first time. For more advanced learning, one can use the simulation for drag racing that you suggest in "DOE It Yourself." I took a look at this  it promises to be fun! I plan to actually make some balloon cars to see what they will do. "Mark, I teach RSM at the U.S. Military Academy at West Point.I bought your "RSM Simplified" book* for my students this semester. A tradition here at the Academy is for students to get a spring break picture with their text book. The idea is to try and make them at least take a text book with them. There is some obvious RSM/DOE humor, but I thought you might like to put it in the Stat-Ease newsletter." Click the following link to see how CDT Dusty Turner carried on the U.S. Military Academy tradition for spring break: http://www.statease.com/images/turner_at_center_point.jpg. According to Major McCulloh "he is a second semester junior or COW as we call it here. He was born and raised in Center Point, TX." 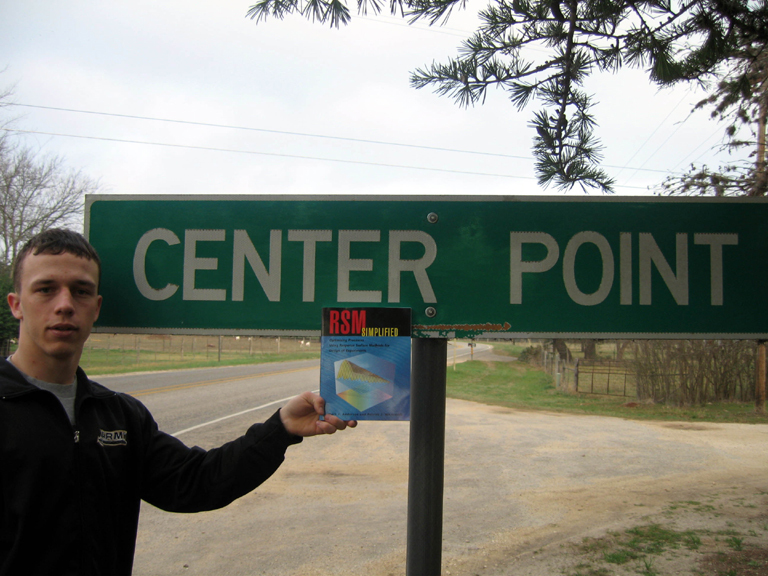 I found 18 "Center Point"s listed for the USA in Microsoft "Streets and Trips" . I suppose that wherever one is must be considered the center point of that person's universe. The "First European DOE User Meeting" for Design-Expert and Design-Ease Users" will be held at the Faculty Club in Leuven, Belgium on April 24 and 25. This DOE conference is sponsored by Stat-Ease with hosting by CQ Consultancy and participation from other European resellers of Design-Expert and Design-Ease software. See details at http://www.cq.be/DOEconference/. The meeting is a must for European users of Stat-Ease software and perhaps the perfect excuse for those elsewhere to take in the sights in Leuven and surroundings. I lunched at the city center some years ago  it was very beautiful! — ASQ's "World Conference on Quality & Improvement" in Milwaukee, Wisconsin on May 1-3, where I will help staff the Stat-Ease exhibit at Booth 424. — PSI (statisticians in the pharmaceutical industry) 29th Annual Conference 2006 in Bristol, UK on May 14-17, where reseller and DOE expert in his own right, Alan Collins, will exhibit Stat-Ease software via his company, QD Consulting. (If you are a corporate technical professional, please pass this news on to your business people!) Quickly identify those factors which affect your sales and marketing results. Learn how they interact and apply that knowledge to make breakthrough increases in sales and profits. Attend the newly expanded two-day "Crash Course on DOE for Sales & Marketing" at the Stat-Ease training center in Minneapolis on April 19 20. See the course description and links to the syllabus and online enrollment at http://www.statease.com/clas_smdoe.html. Note that we will also present a one-day version of DOE for Sales & Marketing at a hotel near O'Hare airport in Chicago this June. "Their fast-paced world of action movies, rapid-fire TV commercials and video games does not prepare todays students to sit and absorb a lecture, especially on a supposedly dull subject like statistics. To capture the interest of these students, teaching must move away from lecture and listen to innovative activities that engage students in the learning process."